The PGX mallet putter by Pinemeadow is a unique golf club that every man will enjoy having on the course. What catches the attention of a golfer when he gets it out of the box is the precise white finish that gives it a trendy appearance. And once you have it in your hand the extra weight is evident as you can feel it. These two features are the highlight of the club and also what makes it one of the best mallet putters. The 380g weight makes it suitable for fast greens while the anti-glare white finish helps with alignment. Also, this putter features a 34-inch shaft, a ball picker and you also get a custom headcover. Tour-Weighted: At a total weight of 380g the club head on the putter is 40g heavier than standard ones. This tour weighting makes it suitable for use in fast-paced putting surfaces which are becoming more common in courses around the world. Alignment Aids: The white finish creates a contrast with the green which makes alignment easy. But the putter also has three alignment lines that will make it easy for golfers to line it up with the ball. Length: The shaft is 34 inches long which means that it will also work well for golfers that are up to 6’3 ft tall. This length might not look significant for some golfers, but it is crucial in maintaining the right posture. 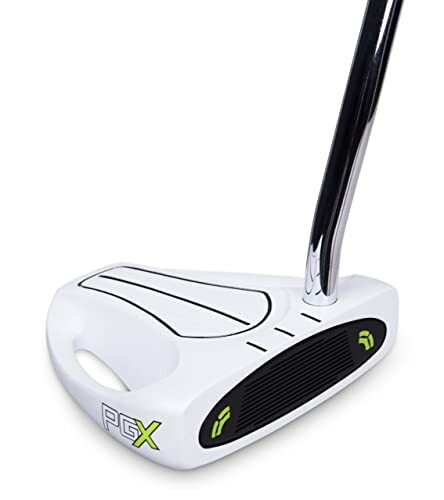 Appearance: The PGX features a sleek and precise white finish that makes the head stand out when you have the putter at the address position. Headcover: This mallet putter comes with a customizable headcover. The white head helps to reduce glare and also the contrast with the green grass makes it easy to concentrate on the alignment lines. This mallet putter also has a ball picker to speed up play and for convenience. At 34 inches long it is just the perfect size for both professionals and armatures. It is a well-balanced putter that is also easy to swing. This putter is one of the most aesthetically appealing on the market thanks to the sleek white finish. The extra weight of the head makes it perfect for the faster greens. It comes with a custom headcover. Golfers used to lightweight putters and beginners may find it too weighty. The white head means that it will stain easily. White paint on the toe starts peeling off after a few uses. Pinemeadow might not be the most famous name when it comes to the manufacture of putters, but their products are as good as what you will get from the top brands. 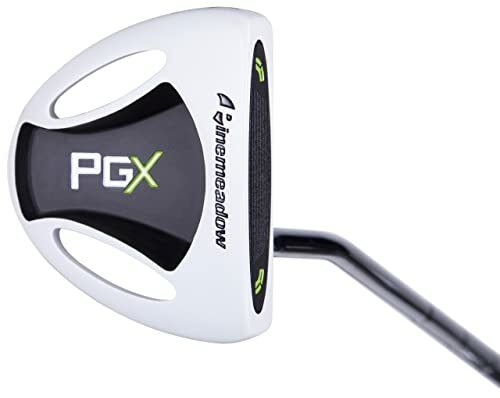 The Men’s PGX is a heavy mallet style putter that the company design to handle the fast-paced greens. It is also a lovely club thanks to its sleek white finish, and the look is enough to make a significant percentage of golfers want to use it. The weight distribution is perfect, and it makes it easy to swing, but it might still feel a little too heavy for beginners or those that are used to lightweight putters. But the weight and the few other cons such as the white finish being prone to staining will not take anything from the fact that it is a top- notch golf club. And so if you are on the hunt for the best mallet putter this sleek and high-performing one by Pinemeadow will be an excellent pick.